I don't know about you, but one of the most frustrating things about online doctor info sites is that they bury key information like phone numbers, fax numbers, addresses, etc. As such, I've developed a new online physician directory called NovaDr. com that has all this information within 3 clicks, whether online or thru the smartphone app. Currently this directory contains doctor information for only 5 hospital systems in Northern Virginia including Fauquier Health, Haymarket Medical Center, Culpeper Hospital, Warren Hospital, and Prince William Medical Center. We plan to add more over the years. 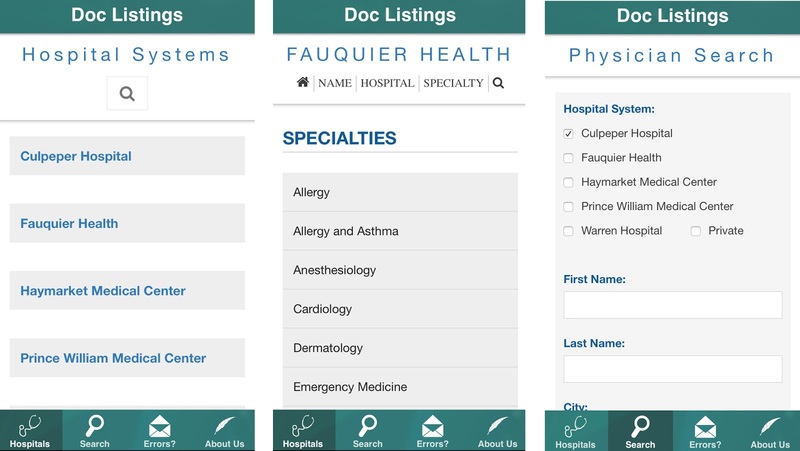 The app called "Doc Listings" is available for free on both Android and iPhones on Google Play and App Store respectively. The landing page address for links to both can be found here.